but may, for strange aeons lie? and what lurks behind it? that moves through the heavens? from April 2000- August 2003.
core of the Weirdass Comics universe. 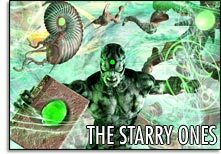 The links below serve as guideposts for the major events in the massive story arc of The Starry Ones, & as jumping on points for when some really cool things are happening in the story for new readers. Start at your top left and work your way down the columns. If you dare. Simyan Keyholder attacks Camp Frasier to win the black book from the U.S. Government. IA, IA, the gate is opened, and the Old Ones are free. Arthur Dorset is reborn as Simyan, the propheced Keyholder of the Old Ones. The Grey attack the Karzon Homeworld Tamiat, loosing bloody Havok. An army of orthodoxy, the angels maintain a staus quo. The conflict that will tear the universe apart truly begins when the Goon return. From amongst the machines, a digital messiah shall arise. Exiled Fthlagen, folly of the Elder Race, is free! The Grey attack the Karzon Empire, and the mighty Cestus war machine. The universe that the Old Ones claim is his property, and Lucifer Morningstar will defend his rights. Enter the armies of order, lead by the Electric Witch Robogrrl. From writer Ancram Hudson and artist Mitch Waxman. A tale of wizards, lovecraftian aliens, and a returning race of monstrous entities called the Old Ones, the first six months of the massive comic epic which ran for 173 weeks at weirdass.net is now available in print for the first time. Book one - Major Arcana. There are many servants of the Old Ones scattered about the cosmos. They are calling out to their brethren on Earth, but who is answering? The folly of the Elder Race was to attempt to evolve past perfection. Witness the birth of Fthlagen. Click here The Old Ones need a powerful wizard, one not motivated by the demands of flesh, to accomplish their goals. Meet the Skeleton Prince. Coming soon Ever wonder where Hampton Jitney gets all his magickal power from? It's all in your mind. Click here On Planet Rossum, the machines have lost all purpose since the events detailed in the Starry Ones concluded. Meet the 3 Mekka. Click Here The story of a man caught in a personal hell. His journey of transformation began when the Alien Overlords conquered the Earth. Since the events detailed in the Starry Ones concluded, Empirate Space has lost any sense of law & order. From this chaos emerges the enigmatic Golden Horde. Click Here lJohn Rovnak and Justin Atherton contribute this tale of a personal relationship with the dark one. Hey, the devil can be a real jerk sometimes. Ready for something completely different? Head over to weirdass.net and see what Mitch Waxman and Ancram Hudson have in store for you. You'll find comics filled with warring robots, lovecraftian aliens, immortal wizards and grand prophecies. Get your copies to enjoy at home or check out the freebies online. Take your time and peruse the whole site, there's lots to discover, from stunning line drawing to intricate 3D metascapes. 32 pages of blazing B&W heresy, Ancram Hudson & Mitch Waxman bring us "Sympathy for the Devil, stories from the kingdom of Lucifer Morningstar". available on-demand at comixpress.com From the creators of the Starry Ones- six very weirdass comic stories exploring our Lovecraftian side. available on-demand at comixpress.com Next in our channel of stories from the Weirdass Comic universe will be "The Story of Phil". Phil ran as a daily following the Starry Ones and soon proved to be one of our most popular stories. color cover by Mitch Waxman. available on-demand NOW at comixpress.com Terrorist, Pirate, Thief, Solider. Who are the Hordemen? What do they want? The traders Guild of Mammun need to find out. Follow the bloody trail that the Golden Horde carve across the stars. If you can get lost in a picture for hours, this portfolio edition of The Starry Ones art is for you. You'll enjoy 80 pages of intricate 3D metascapes presented in glorious color without word balloons. This collection of amazing images focuses on the pure art of Mitch Waxman. It's the perfect size to take wherever you go, so pick up your copy today. How can you guarantee yourself 12 months of excitement? Get yourself a Starry Ones calendar, of course. See Mitch Waxman and Ancram Hudson's celebrated opus come to life every day of the year in this lush, full-color, coil-bound calendar. You'll meet the prime characters and visit important worlds as illustrated in The Starry Ones graphic novels and online comic strip. comic epic which ran for 173 weeks at weirdass.net. This is book one - Major Arcana. Mitch Waxman went to Greece to visit some people and take some pictures. Athens, Crete, and San Torini are revealed in this 92 page book. 2 eyes made out of Coal. Our pal James is one hell of a photographer. He took a trip to Sicily and came back with this amazing series of shots.